I seasoned my shrimp with deodorant last night! 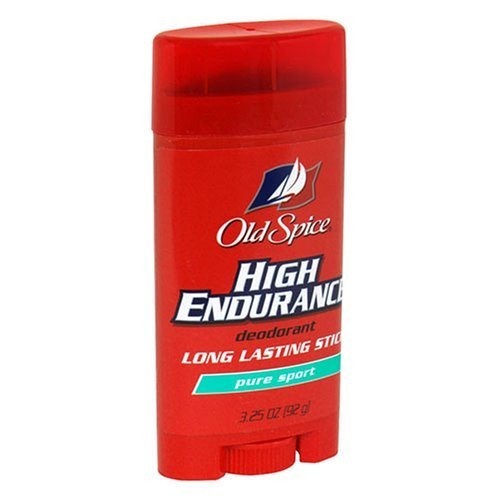 Even though I think Old Spice is one of the most fantastic smells in the entire world, I’m not about to douse my shrimp in the antiperspirant. Whoops. Sometimes typos lead to some pretty funny errors… but most of the time they make me die a little inside when I catch them after I publish a blog post. At least this one made me laugh! Today began with a great workout. I started with 20 minutes on the elliptical while reading Parenting magazine. Yep, slim pickings on the magazine rack again. Today I learned about how to handle your child’s sarcasm. The other day I was looking up new workouts on a variety of websites and found a new-to-me move on the Men’s Health website. I obviously had to decrease my normal squat weight since the move concentrates on working one leg at a time and I definitely felt myself struggling to properly balance without compromising my form. It was tough and a great new move for me to try. I’m sure it will pop up in my future workouts! 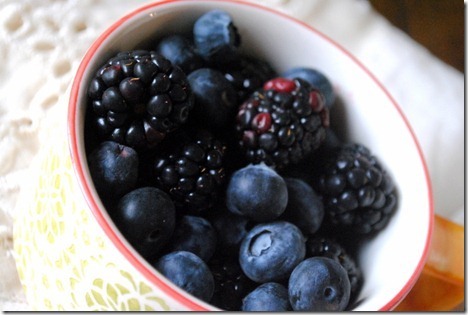 On the way home from the gym, Ryan and I stopped by Walmart to grab some fresh berries and other necessities. Whenever we brave Walmart, we try our best to do so right after the gym because it’s a much less intense experience before 7 a.m. when the crazies are still sleeping. When we got home, I snacked on two mini mugs full of blueberries and blackberries and sipped on a hot Godiva pumpkin spice coffee while prepping my main meal. The little mug holding my berries is from Pier 1 and I am kind of in love with it. My mom bought a set of four of the mugs on sale and my dad thought they were silly and frivolous and took up unnecessary space since they’re too small for a decent cup of coffee or tea. Naturally I swooped in and took them back to Ocala with me. Score! 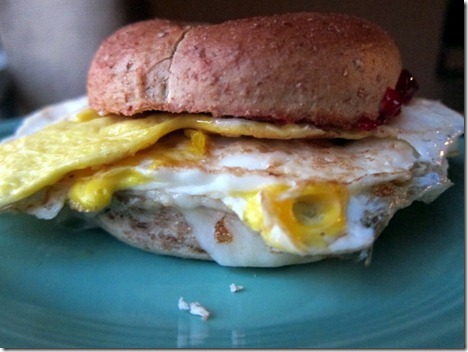 Once my bagel was toasted, I also ate a bagelwich with muenster cheese, two fried eggs and jelly. puahahaha I love your error! That’s hilarious, and probably something that I would do…:P and bulgarian splits are da bomb! And they’re killer too. 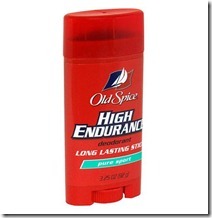 Aw, I love the smell of Old Spice – it reminds me of my grandpa 🙂 But you’re right, not good to eat. 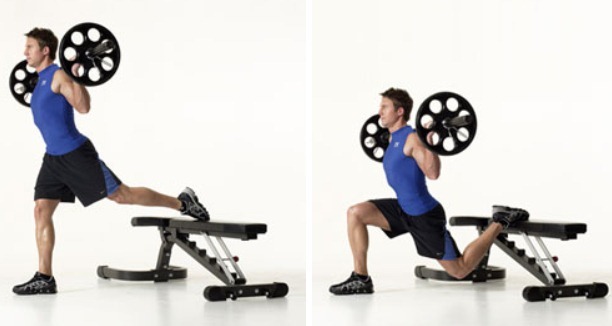 Bulgarian Split Squats are in one of my favorite workouts. Total tush kicker! A girl was doing those split squats with a personal trainer at my gym this morning and I inched a little closer to them while doing my own weights to learn how to do it properly! Such a coincidence! Gyms need to refresh the magazine selection for sure. um, walmart crazies. fo’ sho. if my hubby and i go in there together, we have to remind each other not to fight. there’s something about the chaos and carts everywhere that gets us irritable. I need a new leg workout for this Sunday – I’m definitely using this. Thanks for the idea! 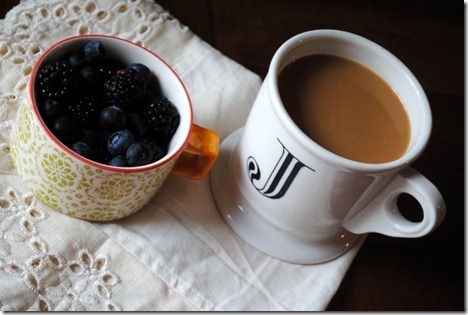 Love that Pier 1 mug – I haven’t been there in a while. Now I have an urge to shop! Hahaha, I didn’t even notice that! Although I will agree with you, I think Old Spice is some of the most delicious smelling artificial man musk out there. I demand that Jesse use the shower gel. I can never seem to do those Bulgarian split squats right. I’ll have to give it another try. And everytime you have a bagel, it makes me want one so badly!! Those cups sure are cute. I see a trip to Pier One in my future. Great workout plan. From my personal experience I have just 1 advice regarding bulgarian split squat – start with fairly light weights – the microtrauma induced by this exercise can feel like major surgical rearrangement of your muscle fibers the day after you try it for the first time.